Where to begin? Presented with 3,000 plants in every shade of green and every texture and pattern of leaves, choosing a subject was no small task at the Lyman Conservatory at the Botanic Garden of Smith College in Northhampton, Mass. I spent the day there sketching and generally getting a much needed green fix after months of winter browns. Here’s the first of the pieces I did there, an exotic pitcher plant native to Borneo. Tips and Techniques: What could be better for practicing how to mix greens? Use house plants or find a greenhouse near you and see how many shades of green you can mix. I used primarily sap green with raw umber and quin rose for the pitcher plants, but burnt sienna made its way into the tops of the pitchers and a lighter mix of sap green and cobalt blue helped the leaves and vines in the background recede. Take care when using reds with greens—mixing the two when wet will give you nice browns, but if you want to keep the red tones, wait until the green has dried and then add a layer of red on top. 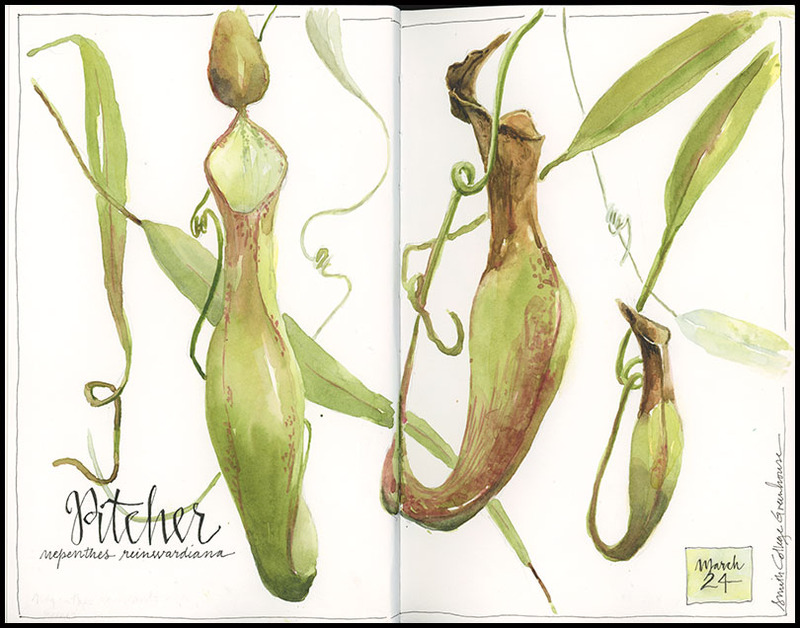 This entry was posted in Journal, Watercolor and tagged greenhouse, natural history illustration, pitcher plant, Smith College Botanic Garden, watercolor sketch by Jean Mackay / Drawn In. Bookmark the permalink. Thank you! It’s fun to make a connection with you in Italy. Glad you are having a spring day there today! What I love about this is the composition, and the motion – these guys are full of life. Well done! And there’s nowhere better on a cold day, is there, than a glass house? Looking forward to seeing more. Makes me want to buy more plants! Thanks for sharing your thoughts. I chose the pitcher plant because I loved the flow of the curling stems and the intriguing shape of the pitchers. The composition flowed from there. Green Fix. I’m with you on that one! I’m glad you chose such an unusual subject to sketch. Pitcher plants and sundew grow in N. Michigan and I’m intrigued by them anyway. Beautiful! Thanks Erica. They grow here too, though not this variety. I haven’t sketched our native ones– there’s always too many mosquitoes biting in those boggy areas. The ones I sketched are from Borneo- can you imagine seeing these in the wild? Nice choice to paint, beautiful. I’m just beginning to do more nature journaling after a few years of doing more traditional botanical illustration type watercolor. I have a quick question…do you use a brush, water brush, pen? for your calligraphy/lettering? I think it adds so much to journaling when done beautifully (as is yours!) but can be distracting and detract from the image when poorly done. Thanks Kat…I agree that text can add or detract, depending on how it’s done. I don’t think you necessarily need great handwriting, but for those whose handwriting is less than stellar, I recommend keeping text to smaller “notes” rather than large words. I tend to use a Micron 02 pen for my drawing and text, though I will occasionally paint the letters using a small brush. Using the same pen I use for drawing eliminates the need to carry extra supplies for lettering and allows me to “draw” the letters as I like. I think traditional calligraphy works best when it is very precise and when calligraphy nibs and inks are used. I prefer hand-drawn letters in my journal because they look less formal and do not need to be perfect, which fits my overall journal style. Experimenting with different techniques will help you figure out what works best for you. Feel free to ask more any time! OH MY!!! I do so LOVE the pitcher plants, and have sketched and painted them often, so YOUR watercolor was such an amazing treat when I open my e-mail. WOW! You have captured their unique grace! P.S. to anyone with a green thumb: Anyone can grow these tropical pitcher plants, the Nepenthes, in your home. Here in Seattle, many local nurseries carry them. The other big group of pitcher plants, the Saracenias, can grow outside year-round, whether you live in northern Florida, or Maine, or Oregon! Great! Aren’t they cool plants! There were several varieties at the conservatory– some much larger than these, and some in a more crowded location that was not conducive to painting. I loved the way these vined and twisted, hanging from the ceiling pipes of the greenhouse. I’d be afraid of killing them off if I tried to grow them at home. But I love seeing these unique plants in nature and in greenhouses. Glad you were pleasantly surprised! Such fascinating plants. Green is nice. I am anxiously waiting for colour!